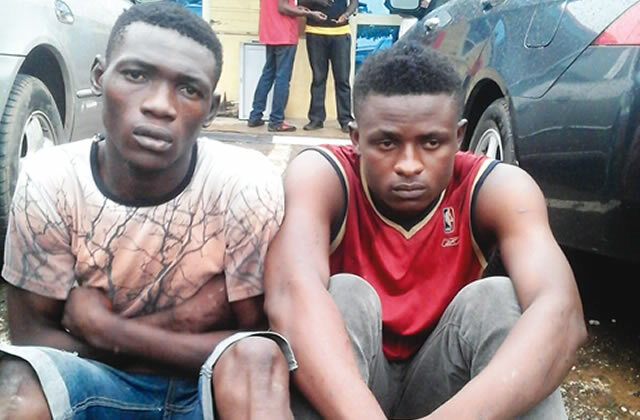 A self-confessed cultist has said he wanted to avenge his brother’s murder but killed the wrong person after his friend deceived him. The suspect, 21-year-old Morufu Liadi, allegedly killed a 29-year-old motorcyclist, Lateef Sura during a birthday party in the Alakara, Mushin area of the state. Liadi, who had an accomplice, Rilwan Balogun, told our correspondent that he stabbed the motorcyclist several times on the neck and on his waist till he died because he wanted to avenge the death of his brother who was killed in 2008. Speaking with PUNCH Metro on Tuesday, Liadi, who recalled that he stabbed Sura to death with a table knife, said he was told that the deceased was responsible for the death of his elder brother, Azeez, in April 2008. He said, “On that Sunday, my colleagues came to see me at home and said we were going for a birthday party at Agbekolade Street, Mushin. I usually stayed in the Oju Irin (railway) area . The Aiye and the Eiye cult gangs have a feud in the area. “It was my friend, Rilwan (Balogun), and others at the party who pointed the man to me that he was the killer of my elder brother. I had not met the deceased before. “My elder brother, Azeez, also known as Arsenal, died in April 2008. He was killed by cult boys. So, I jumped on the man and began to stab him. I stabbed him several times on the neck and on the back. I used a table knife. I did not know that I was deceived. Balogun, 23, an indigene of Kwara State, who reportedly pointed the deceased to Liadi, said he mistook the man for a cult member in Idi Oro. “It is true that I was the one who pointed out the deceased to Liadi. We had been invited to the birthday party by friends. I told Liadi that the deceased was an Idi Oro hoodlum. And then they jumped on him and began to stab him.